The Open Source Software Drupal is a very user-friendly Content Management System (CMS) to create and organise websites. By now it is used by a couple of million people worldwide is developed further constantly. Due to its flexible usability and because it focusses on building communities with co-working and easy interchange it enjoys a growing popularity especially in the Open Source scene. Among the better known Drupal projects there is the online presence of the White House, amnesty international or the German dictionary publisher 'Duden'. During times of internationalisation the localisation of websites becomes more and more important. The sale of goods via the internet alone requires a multitude of sales-promoting measures for the various target markets in their respective national language. The more a business exports into other countries the bigger is the challenge. Both product information and marketing materials for the public image of the company achieved in using websites, prospects or catalogues need to be translated most comfortably and in the highest quality possible into more and more languages. Thus setting itself apart from competitors. 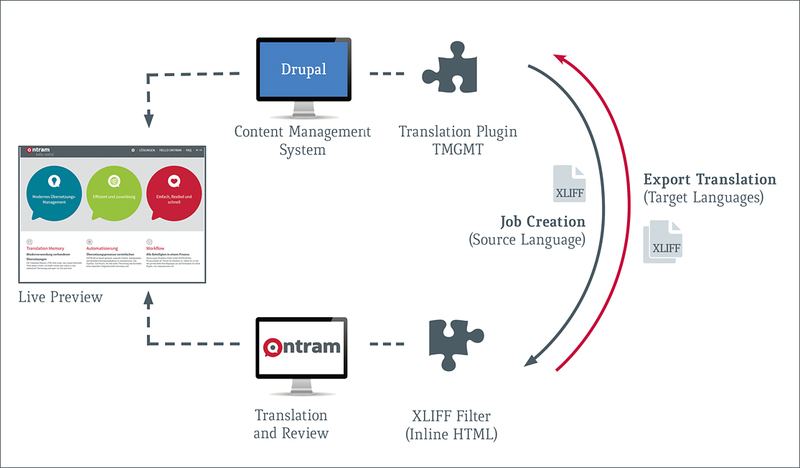 Using ONTRAM the translation of content of Drupal can be done instantly. The translation Plug-In (Translation Management) offers an easy connection. Therefore it is possible to either translate short passages directly on the Drupal interface or more extensive texts by transferring them to ONTRAM and create a translation job. The transfer happens directly via the ONTRAM interface making the laborious plying with exported data obsolete. ONTRAM offers all known features as Translation Memory, Terminology and quality checks. While using ONTRAM opening up a preview to check the translated text in the Drupal layout is possible at any given time. When a job is complete the result is automatically transferred into Drupal. If there are later changes in the source language in Drupal it is possible to mark the corresponding translations as 'out-of-date' to take them into account for the next translation run therefore ensuring the current status of the target language text.